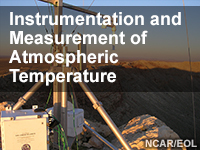 This lesson offers a comprehensive overview of temperature measurement as related to the atmosphere, bodies of water, soils, and other parts of Earth’s surface. The lesson begins by defining temperature and why it is an important property to characterize. It provides details about the properties and characteristics of sensors used for temperature measurements and the advantages and disadvantages of different sensors depending on the application. Lastly, the lesson outlines the methods used for measuring different types of temperature, from soil to the free atmosphere. This lesson helped me very much to acquire more knowledge. As with the introductory lesson, many definitions are ambiguous. Answers to some of the questions sometimes seemed to be more dependent on the biases of the authors rather than the characteristics of the sensors and systems. This is a good broad overview of the subject. The sensor features are confusing. The lesson was very interesting and also educative. thanks. This lesson helped me very much to acquire certain knowledge that will be useful to my field of studies. It presents graphical data and animations to enhance one's learning capacity. Identify the relationship between molecular kinetic energy and the temperature of the air. Describe the site selection criteria used to identify the best location to measure surface air temperature. Recall the various types of liquid-in-glass thermometers and describe the best uses of this instrument type. Discuss why calibrations are important for all temperature sensors. Describe the main calibration processes used for temperature sensors and how response times differ among types of sensors. Describe the basic science involved in estimating temperatures from acoustic sensors, such as sonic anemometers/thermometers. Describe the types of measurements that can be obtained using radiometric sensors. Describe the considerations relevant to measuring temperatures from aircraft or other fast-moving platforms. Select an appropriate instrument to measure temperature based on the requirements for data (uncertainty, spatial and temporal resolution, etc. ).